As Britain's biggest toy company - most famous for their bestelling Moshi Monsters toys - Vivid is a true heavyweight in the licenced toys category. Having already produced some revered ranges based on celebrated TV shows such as Baby Jake, Cloudbabies and Canimals, they've only gone and done it again with the hit Nick Jr/Milkshake show, Tickety Toc. Based on the charming and madcap world of Tickety Toc, Clockhouse Playset is one of the showcase products in the range and is set to be a sure-fire hit with little Tick Tocketeers everywhere! Complete with train track and push along Pufferty train to take the Tommy and Tallulah figures back for Chime Time, the Clockhouse Playset represents the heart of Tickety Town. The playset has everything a Tickety fan needs to recreate the magic of Tickety Toc at home. Keep an eye out for various other toys in the range, including Talking Tommy, Talking Tallulah, Musical Pufferty Train and some adorable plush toys. 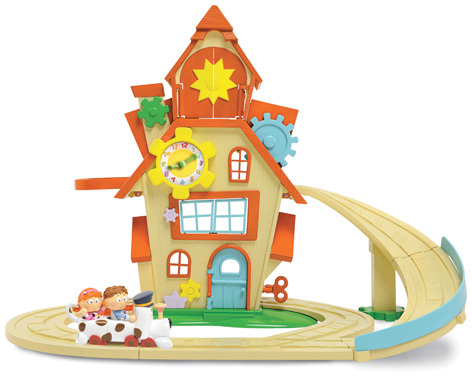 Please tell us what you think of the Clockhouse Playset by Vivid.